Illinois Gov. Bruce Rauner delivers his State of the State address to a joint session of the General Assembly in the House chambers at the Illinois State Capitol, Jan. 27, 2016, in Springfield, Illinois. Illinois Democratic Senate President John Cullerton says he's delaying sending a funding bill for colleges to Gov. 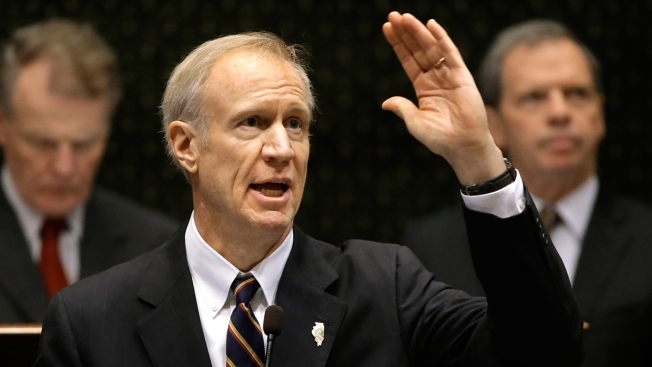 Bruce Rauner in the hopes he'll reconsider his threat to veto it. Democrats last week approved a $721.5 million to be split between community colleges and tuition grants for low-income students who qualify for the Monetary Award Program. Democrats say colleges and students need the money because they haven't received state support since July 1, when a new state budget should've been taken effect. Rauner's budget office is advising the Republican governor to veto the proposal because there's no revenue for it and its not connected to any spending cuts to make up for it. Cullerton said Monday he'll wait until Feb. 16 to send Rauner the bill so he can reconsider his position.